Do you travel out of town often? It seems that most of my weekends are spent traveling. I love spending time with the boo or visiting my hometown. 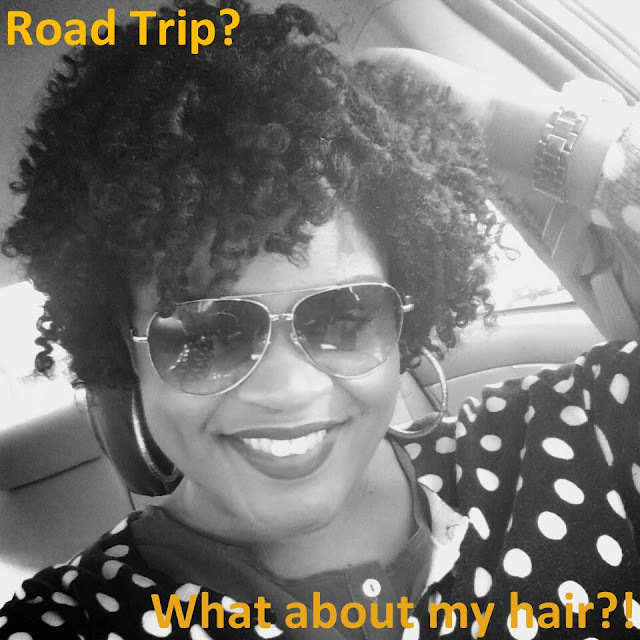 With this in mind, I thought it was a great idea when Baby Shopaholic mentioned doing a post about what I bring with me to care for my natural hair while traveling. Surprisingly enough, I don't bring much! The key to caring for my natural hair while out of town typically begins before I even leave. Whether I am going on a short trip or a long one, early preparation makes a huge difference. I will take the style I am presently wearing and go with the flow. 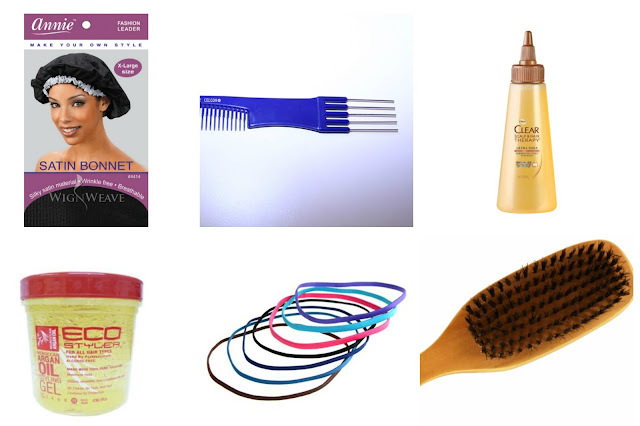 I typically wear my hair in a twist out so as long as I have a satin bonnet, hair pick and hair oil, I'm good to go! I will sleep in the satin bonnet and use the hair pick and oil (if needed). In the chance that my style gets old, I tend to pack a hair elastic, gel and a brush to smooth into a puff just in case. For these trips, I typically know in advance so I prepare my hair beforehand. Since the easiest style for me to do is a twist out, I will typically twist my hair one to two nights before the trip. To get my twist out to last longer, I will allow the twists to dry for at least 24 hours. I can achieve this by doing the twists two days before or the night before and wearing my twists until I am ready to take them down. To protect my hair, I sleep with a satin bonnet and fluff in the morning with a hair pick and apply moisturizer if needed. I tend to keep a travel bag prepared with all six of these items so that when I need to travel, I can grab it and go! How do you protect your natural hair while you are out of town? I'm like you, I can't leave town w/o my Ecostyler gel. Smart idea to have a prepacked travel bag. I'm always forgetting something. Great post! My hair is natural but I get it straightened. Keeping it wrapped is about all I do, lol! I mostly stick with wigs and braid! I am traveller too. I love it. I am curls lover, I also love your cute smile. You are lovely girl. have a nice weekend sweetie. I thoroughly enjoyed reading your routines!! I salute you for going natural -- not only is it so much more flattering to your hair texture, it is also healthy, modern, stylish and makes you an expert niche blogger :)) Seriously, way to go hon!! Great post doll! Thanks for the shout out! I never leave home with out a satin scarf or bonnet! Girl... Having the bag already prepared is so easy for me, especially when I have to rush and be out the door quickly. It saves a lot of time. I need to get more of the travel sizes of the EcoStyler gel. I'm running low and I need my edges on point. LOL! LOL! Well, nothing wrong with that. You still have to have your silk wrap or bonnet and a comb. :-) Thanks so much for stopping by! I completely understand that! I may get some braids this summer. So easy and pretty! You know I had to shout you out since you gave me the idea! Thanks again!